Don’t you just love when you can ‘have your cake and eat it too’? Now I know that phrase can mean different things to different people depending on what you’re talking about; but for me that means a meal that’s delicious, filling, and healthy! A salad doesn’t have to be boring or make you feel like you’re eating ‘rabbit food’. 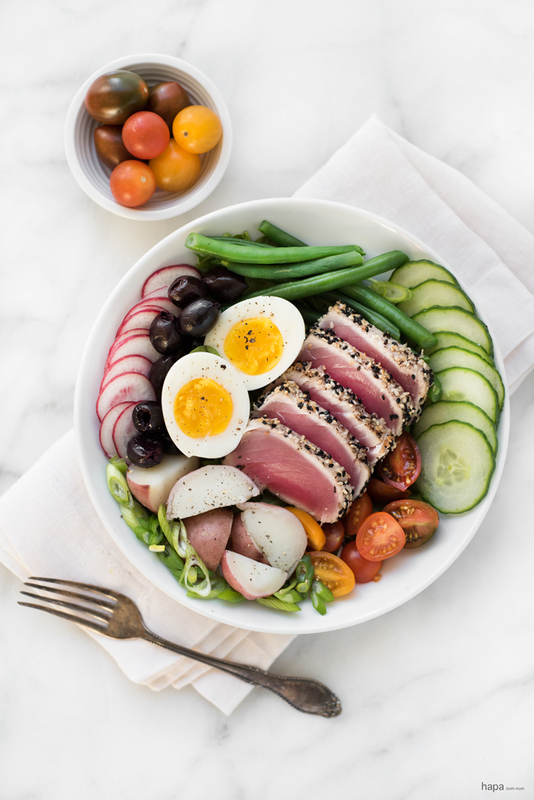 Salads can and should be flavorful, exciting, and fill you up – just like this Sesame Crusted Ahi Tuna Nicoise Salad. Niçoise pronounced [niˈswaz], actually means ‘in the style of Nice’ – a seaside city in Provence, France. A Salade Niçoise is a traditional salad – neatly composed of green beans, black (Niçoise) olives, anchovies, tomatoes, tuna, and hard-boiled eggs. These days the sky’s the limit when it comes to what you can add – I included some mini red-skinned potatoes, red radishes, cucumbers, scallions, and a medium-boiled egg with a perfectly creamy yolk. The vinaigrette is a perfect balance of garlic, shallot, lemon, Dijon, sherry wine vinegar, and extra virgin olive oil. Seriously, this vinaigrette is wonderful – I kept dipping veggies in it before I even put the salad together! Many Niçoise Salads these days use canned tuna, some use seared tuna steaks, but I have a bit of a love affair, if not outright addiction to sesame crusted tuna. I adore that quickly seared outside that’s slightly crispy and how it’s juxtaposed with the beautifully colored rare inside. It’s the perfect bite, and pairs beautifully with this classic French salad. Go to a reputable vender – one that goes through a lot of fish. For me, that’s my local Asian market – they have a great selection and there’s a lot of turnover. Also, many general grocery stores these days have a sushi counter that sells packages of sashimi for lunch, this is another good option. Observe or ask if their ‘sushi-grade’ fish is prepared and stored separately from their other fish – this will prevent cross-contamination. Use your senses – smell, touch, and sight. The fish should only smell like the ocean, it should be firm to the touch, and the color should be bright and vibrant. 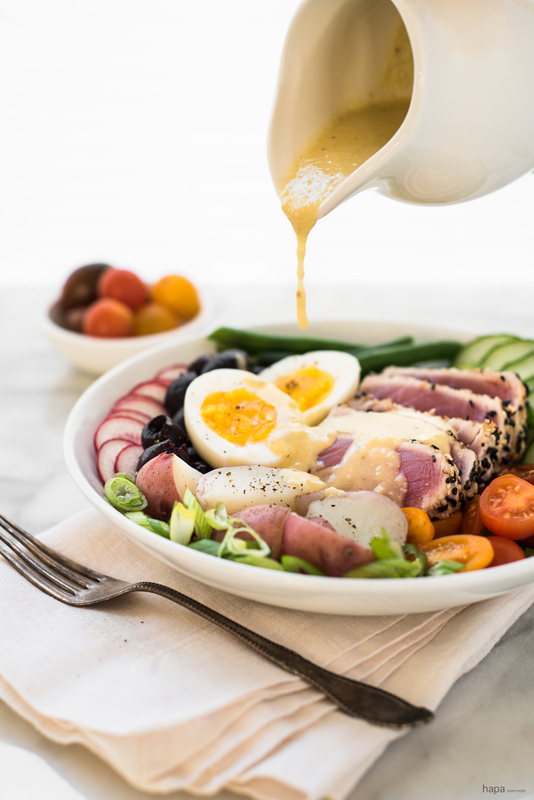 Perfectly seared sesame crusted ahi tuna on a bed of fresh veggies, topped with a creamy egg, and drizzled with a finger-licking good vinaigrette, give this Nicoise Salad a 'WOW' factor! In the bowl of a food processor, add the shallot, garlic, mustard, lemon juice, and sherry wine vinegar. Slowly add the olive oil as you puree the mixture. Season with salt and pepper to taste and then give a few more pulses. Set aside. Bring a large saucepan filled halfway with water to a boil. Decrease the heat to a simmer. Quickly and gently lower the eggs into the water one at a time, using a spoon. Cook for exactly 5 minutes and 30 seconds for a creamy yolk. Remove the eggs as soon as they are done and rest on the counter. Once cool enough to handle, gently peel the eggs (the yolks will be soft, so the eggs will be a bit delicate). Set them aside, don't slice them until you're just about to serve. To cut down on time, cook the potatoes and green beans together. Start by filling a bowl of ice-water to shock the veggies (green beans) after they cook. Then place the potatoes in a medium saucepan and cover with cold water. Season the water with salt and bring to a simmer. Cook the potatoes until fork-tender, about 10 minutes. During the last 3 minutes, add the green beans. Once cooked, strain the potatoes and green beans from the boiling water and then shock them in the ice-water just until they've cooled. Drain the ice-water and set the veggies aside. Go ahead and plate the arugula, cucumber, scallions, tomatoes, radishes, and olives before you work on the tuna. 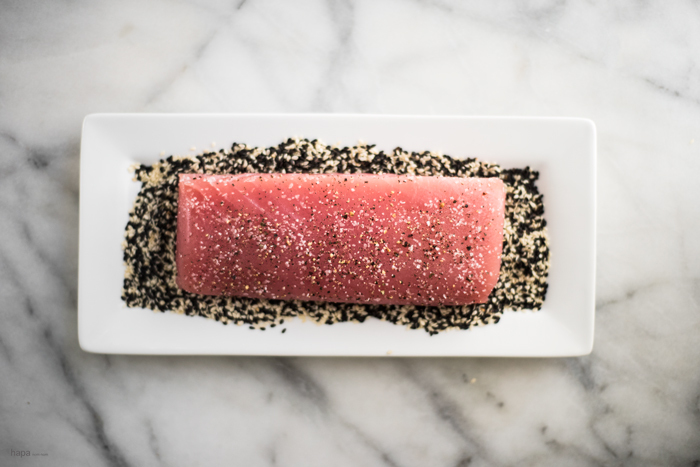 Combine the white and black sesame seeds on a plate large enough to accommodate the tuna. Season both sides of the tuna with salt and pepper. Then press all sides of the fish with sesame seed combo. Warm the grapeseed oil in a skillet over high heat until shimmering. 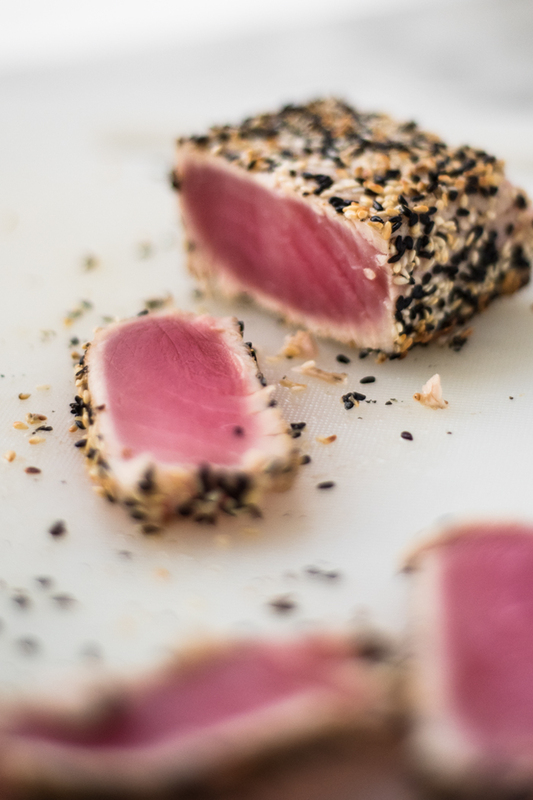 As soon as you see the fist little wisp of smoke, add the sesame crusted tuna and cook for 30 seconds per side - 4 sides (don't worry about the 2 ends, they will cook during the turning). Slice the sesame crusted tuna ¼-inch thick and add to the salad. Serve with the vinaigrette and enjoy! * The viniagrette, eggs, green beans, and potatoes can be prepared the night before and refrigerated. This is an amazing interpretation of a Niçoise salad! I love the tuna you added, as well as the overall presentation….beautiful!! SO on the same wave-length this week – I guess great minds think alike?! haha! Sesame crusted tuna is the best, and I love the sound of the nicoise salad you have paired it with. Love Nicoise salad and it reminds me of Europe! Your tuna looks perfect and the salad looks very delicious! Ooo… ooo…ask him if I can go to Hawaii too 😉 Seriously though, I think I could live off of sesame crusted tofu! This is officially my new favorite lunch. I hope you enjoy! Such a gorgeous salad and definitely not “rabbit food” unless the rabbits are living the good life! This needs to be my dinner sometime this week! That is one super delicious looking salad, girl! I love your “they sky’s the limit” comment because I just made a one with salmon, poached eggs, and asparagus! Thanks for the tuna/sushi grade lesson too! Oh my, I’m coming to your place! Salmon, poached eggs, and asparagus sounds amazing!